ByAnnies Folding Wallet Class taught by Cindy B. 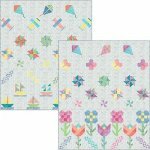 Come join Julia as she guides you through the block making process of the wonderful Gypsy Wife Pattern by Jen Kingwell. Come join us for some machine embroidery! Come join Terre and learn how to Paper Piece! You will make your top and quilt it too! Have an unfinished project you need some help with? Come and join Cindy and she will help you get going again! Join Terre for a 5 Month program to make this beautiful quilt. 12 Month Block of the Month (BOM). $15 registration fee, $24/mo fee. Bring your own project and come sew with us! Terre will be here to help you with your paper piecing projects. Bring your machine, pattern, material and questions, Terre will be happy to assist! Third Wednesday every month - open sew day! Bring your own project to work on and have fun creating, snacking and chatting with your fellow quilter's!